CMX Summit speaker submissions are open and early bird tickets are on sale! 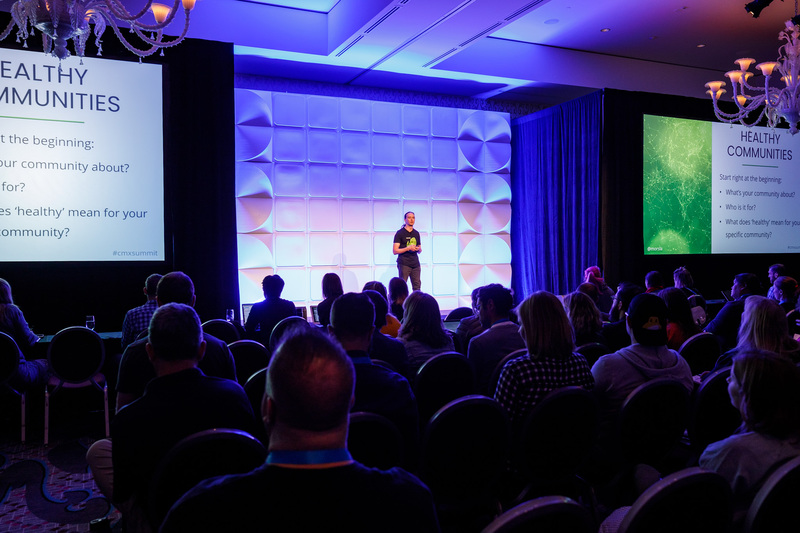 CMX Summit 2019 is coming to Redwood City, CA (Bay Area), September 5-6, and we’re thrilled. Speakers play a key role in any great event and this year we’ve raised the bar. At CMX Summit 2019, our stage will see the likes of Kim Scott, the author of Radical Candor, and Nick Meheta, CEO of Gainsight. We’d love to have you too! Having read thousands of speaker pitches, there are a few key things that separate a great pitch from one we won’t read a second time. As you begin to write your pitch, use this blog post as a resource for what makes a good speaker submission for CMX Summit. I want you all to submit incredible pitches. Go ahead, make our choice difficult! Introduces a focused topic, and uses concise language to do so. It explains to the event organizer what the audience will learn and walk away with from your time limited session. A good pitch should be submitted with a short bio explaining your relevance and (bonus) links to videos of past talks. Major hurdle #1 — your pitch needs to focus on something about community building or adjacent and relevant to community builders who make up CMX Summit’s audience. Do not pitch a generic “how to build your community” talk (this is what the entire conference is about!). What all these topics have in common is that they are focused and relevant, and don’t worry about cleverness in your title as we workshopped all of these. To make sure you are concise, there’s a word count limit on the form — 1,500 characters. A 3,000 word treatise on setting up governance is a book proposal, not a session pitch for a 20 minute talk. Do not link to Google Docs, Evernotes, Dropbox, or other places that let you novelize. Your session’s description should have an emotional impact of curiosity and excitement. Use language that shows you’ve put thought into this topic and are bringing all your experience and expertise to the table. Your audience for this pitch is me – Erica! – (and David, Sam, Beth, Derek, John, and Lincoln). A lot of pitches can come across like sales or marketing teasers. Don’t write your description to fit in a programming booklet that will get people excited about your session. Instead, write details about your topic, what the audience will learn, and specifics about the content. When does one equal far more than one? Join the (R)Evolution to discover how to cultivate your creative spark and that of others to set you, your team, and your company on the path to betterness. This is great for a conference attendee who is trying to choose between Denise’s session and another one. This is not great for a conference organizer trying to figure out which pitch to choose. In your speaker pitch, you have to explain what the audience will learn and what you are actually going to talk about. You have to share the tactics, the data, and the takeaways the audience will leave with. Your pitch is a book report on your talk, not the book jacket blurb. Your pitch should demonstrate knowledge of who CMX Summit is for and how your topic and the details will positively impact the audience. In the pitch form, there is a dedicated space to explain why CMX Summit is the place for you and what motivates you to be on stage. Remember: CMX Summit does not allow sales pitches on stage. A lot of sales-style pitches come off as ads, and will be immediately discarded. With focus comes an understanding of time limitations. Most sessions at Summit 2018 were 20 minutes long. This is another reason for the word count limit. You cannot always fit everything into a single presentation. We are not accepting pitches for workshops, and there are no sessions over 40 minutes. Your topic must be flexible enough to fit into a conference schedule, not the other way around. A good bio explains who someone is in relationship to the conference audience and the topic they will speak about. It demonstrates why you should be picked, why you should be listened to, and hints at your personality. The bio field has a word count too — 600 characters — because this is not your memoir. Don’t worry about not personally having an Amazon #1 best-seller; I don’t either. Most of the speakers we book also don’t. But this bio tells me why Michael should speak about storytelling, how he will connect with my audience, and a bit about his personality, plus if you meet Michael, you’ll realize this bio is very honest. Conference speaking is a catch-22. Most speaking opportunities require experience, or evidence of success, but how do you get experience if speaking opportunities won’t have new speakers? Personally, I am a huge advocate for new speakers, and speakers who we don’t get to hear from often. At CMX Summit, we have a commitment to diversity and inclusion all around and on our stage. Part of this means that we have a mix of new friends and old friends on our stage. Have a recording of yourself giving a presentation, doing a webinar, or on a podcast? Link it up. If you don’t have that, get your smartphone, tap record, present on a topic, and upload it to YouTube. I once booked a speaker whose only video was a (non-relevant) comedy standup routine. This is an aside for my Amazon best-sellers, please make a full pitch. I’ve had speakers I know and speakers who’s industry “celebrity” leads them to only put a title and their bio in the form. This is frustrating because the title cannot carry a talk alone. LeBron James can’t just walk onto a basketball court and announce his team’s won. He has to play the game (James is a very famous and good basketball player). The best pitch we got for Summit 2017 was from Jennifer Sable Lopez from OutSystems. Now that you’re ready with a fabulous pitch, let’s get to the goodies. Coaching, process, and any assistance you need from us in getting you to the CMX Summit stage. I have experience with over 200 speakers, and my goal is to make your talk the best of your career (so far). *If you’ve already bought your ticket or want to buy your ticket to lock in our early bird prices, go forth. If you are selected, we will refund or otherwise transfer your ticket. *If you need travel assistance — for non-Bay Area speakers — there are limited funds for travel and lodging reimbursement, which will cover some of your costs, but not all. Submissions are now closed for Summit 2019! Thanks to everyone! How many applications do you expect? Last year, there were 120 speaker applications, up from 85 in 2017. We expect even more! This year, we’re expecting to book ~10 speakers from these applications. Submissions end Friday, April 18th at 5pm PT, and I expect it will take around a month. Everyone will hear back either way. No. Sorry, but that would put you at an unfair advantage.